Our latest Publish 3D V18.3 is now available with new and improved product features and enhancements for the CATIA Composer user needing to work with JT data. The Publish 3D range provides interactive, batch and command line interfaces for CATIA Composer users to directly access JT data independently of any JT products, is self-contained and version independent for improved ease of use. Composer users can now open JT data including geometry, assemblies, product structure, metadata and product manufacturing information. The system is very quick and easy to learn and use with functionality driven from a pull down menu aiding the creation of assembly procedures, technical illustrations, interactive 3D product experiences, training materials, marketing materials, sales tools and more. Working within the Dassault Systèmes’ Composer architecture, there are two additional ways for the Composer user to incorporate JT data; multiple batch processing of JT is accommodated by using a “Sync” interface and a command line interface enables integration with PLM applications through Enterprise Sync. V18.3 supports 3DVIA Composer (up to and inc.2015), CATIA Composer (up to and inc 2016x) alongside API support for Dassault’s MultiCAD and JT’s Jtk 7.1.5 which can output Composer data. Additional support has been added to a number of functions. There is improved view states support for geometry and PMI, along with support added for 3DVIA Assembly PMI and CATIA Composer, and enhanced support for Large Assembly Processing (LAP), and PLMXML assemblies are now supported with the addition of PLMXML Read support. The ability to turn off the reading of PMI model views and improved attribute display for the JT imports are also new V18.3 features. 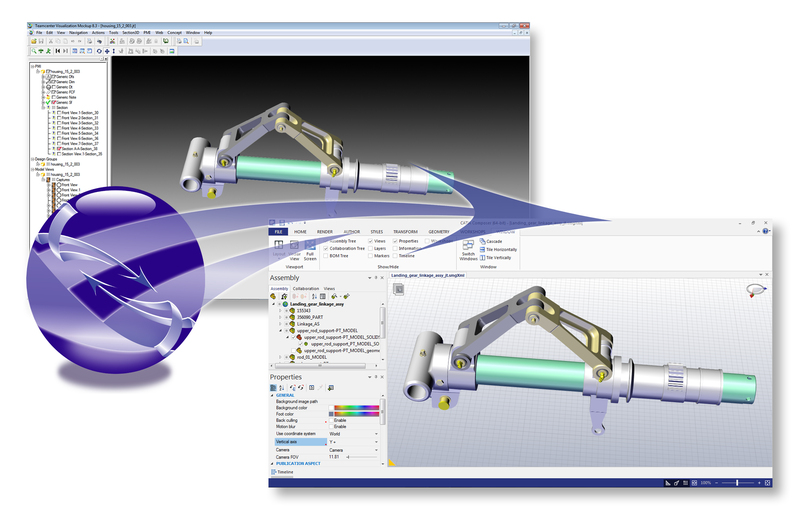 With the growing trend to re-use 3D design data across business enterprises, the integration of Publish 3D and Composer enables users across the enterprise to work with JT files to meet and overcome longstanding business challenges of reducing costs, improving quality and reducing timescales and delivers tangible business benefits. © Copyright Theorem Solutions 2019. All Rights Reserved.